We left Plimmerton on Sunday morning and travelled via the Pauatahanui Road to the Hutt Valley. It was a beautiful day to enjoy the pretty drive around the Porirua Harbour before turning right to head over to the Hutt. Towing our caravans over the Rimutaka Hill was a new experience. The road had been closed a couple of days prior, due to high winds, but our guys were confident it would be fine. This Remutaka Crossing Memorial at the summit was unveiled on 27 September 2015 when a re-enactment of the original crossings took place. During WW1, 60,000 troops marched from the military training camp near Featherston in the Wairarapa, over the Range, to the Hutt Valley and on to Wellington, from where they were sent to war. Many of them, young and full of life, thought they were embarking on a grand adventure. It’s quite a climb, this road over the Rimutaka (now called Remutaka) Range. We stopped at the top to take in the views. You can see some of the road we’ve travelled in these photos I shot from the summit. The highest point is Mt Matthews at 940 metres, or 3,080 feet. The 555 metre summit of the road over the range is named the Remutaka Pass. The road (SH2) is narrow and winding, crossing the ridge from the Hutt Valley to Featherston. Once we reached Featherston we decided lunch was needed and found a likely spot in the Brac and Bow. It was busy but we found a table outside in a garden setting. Featherston is home to a great little museum that we didn’t have time to see on this visit. Our friend Terry spent some time here on a former trip though, and said it’s well worth it, so something to look forward to next time. It tells the story of the Fell locomotives that worked the Rimutaka Incline, and exhibits the only steam-powered Fell locomotive left in the world. Six of these H Class engines worked the 1 in 15 Rimutaka Incline for 77 years before being retired in 1955 when a new 8.8 km tunnel was completed. We moved on to Greytown as we planned to spend the night at the Greytown Camp (#5061 in the NZMCA directory), a lovely place in a park-like setting with beautiful trees and great facilities. The manager was very relaxed and told us we didn’t have to leave early the next day as at this time of the year it’s not busy. Lynda and I were able to do our laundry the next morning and get it dry on the line before we left. Greytown is a pretty little town, and we spent the morning wandering around, browsing the boutique shops, and loved this gorgeous garden and homewares shop right in the middle of town. Colonial buildings and cute cottages are beautifully preserved. Featherston was voted New Zealand’s Most Beautiful Small Town in 2017, and deservedly so. The next night was spent at Bush House (#5085 NZMCA) in a paddock not far from Greytown, hosted by Tom. A peaceful rural spot with lots of rabbits who didn’t seem to mind having us for company. The next morning a fog blanketed the land but soon cleared as the sun came out. It was time to move on to the Wairarapa’s largest town, Masterton. 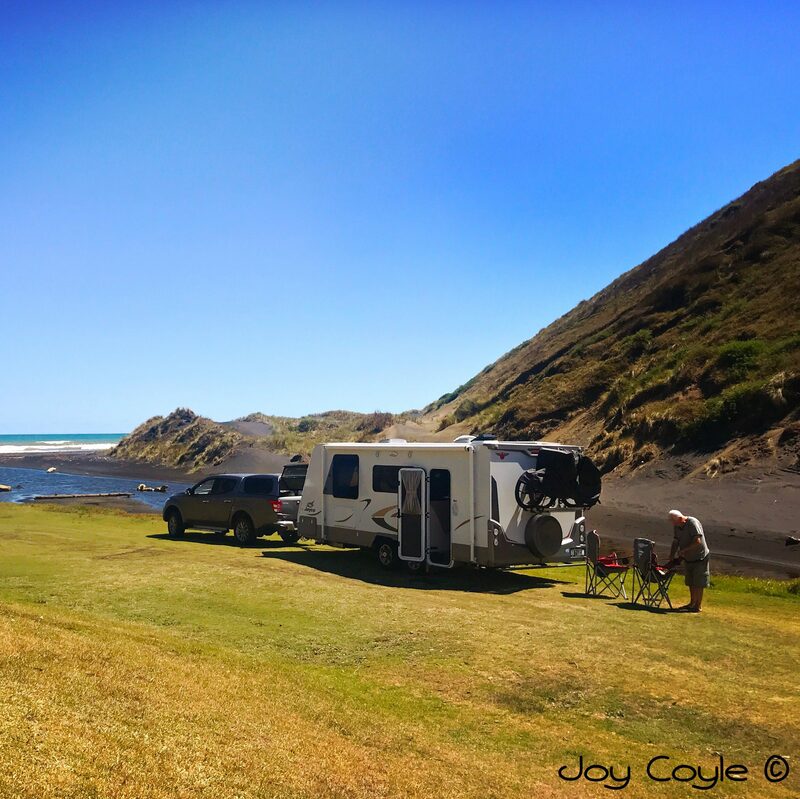 We had arranged to stay at the Mahunga Golf Course (#5007 NZMCA) as we wanted to take a trip to Castlepoint, east of Masterton on the coast, and they’d said they were happy for us to leave our caravans there during the day while we did that. We definitely recommend this place as a stopover. For $10 a night per vehicle, the green keeper is very friendly and welcoming and there are showers and toilets if you want them. It’s just an hour’s drive to the coast and Castlepoint village and lighthouse. It was our first visit, but Lynda and Terry had visited previously on a dull and very windy day, so it was nice that this visit they were able to see it at it’s best. The weather was perfect. On the way there we stopped at a little place called Tinui. It appeared empty, forgotten, and the cafe/pub that was busily serving customers three years ago when Lynda and Terry came through, was closed. … this church held the first ever Anzac service on 24 April 1916 after seven young men of the district lost their lives at Gallipoli. This would have been a huge loss in such a small community. By the end of WW1 thirty six men from the area had been sacrificed to WW1. A cross was erected high on the hill you can see behind the church, by the local community, and still stands there today. Tinui is a piece of the past preserved. Our first sight of the lighthouse that was first lit in 1913 and last manned in 1988. It’s a beauty, as lighthouses go, standing tall and straight on a two million year old reef. Castlepoint gets it’s name from Castle Rock, that large rock in the centre of the photo above. It was named by Captain Cook in 1770 because it’s shape resembles the battlements of a castle. The Māori name for the area is Rangiwhakaoma. The colour of the water was amazing, and we saw a seal playing in the surf just below us. There’s a lot more to see and do in the Wairarapa that a two week trip won’t allow, so I guess that means we’ll be back. I haven’t mentioned the vineyards and wineries that are everywhere here have I?